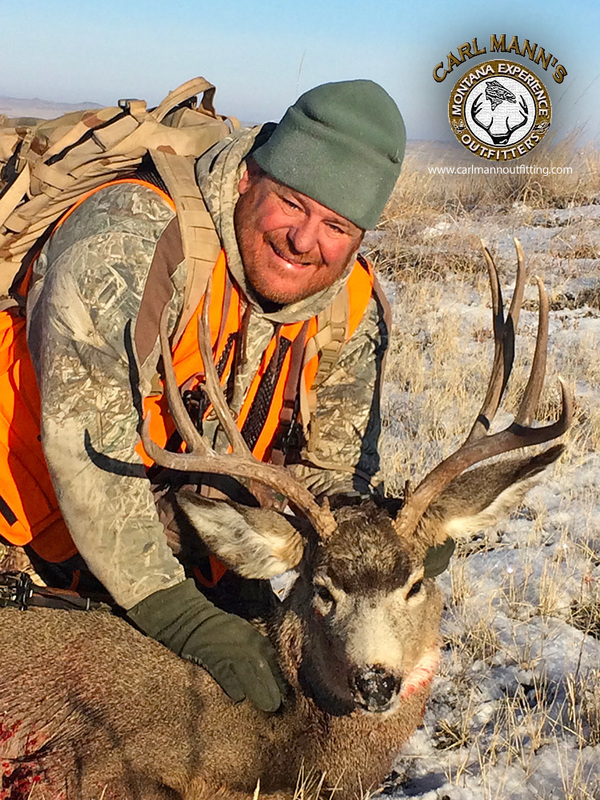 Carl Mann's Montana Experience OutfitterHow to choose which Montana hunt is for you. This is the true Montana Experience! 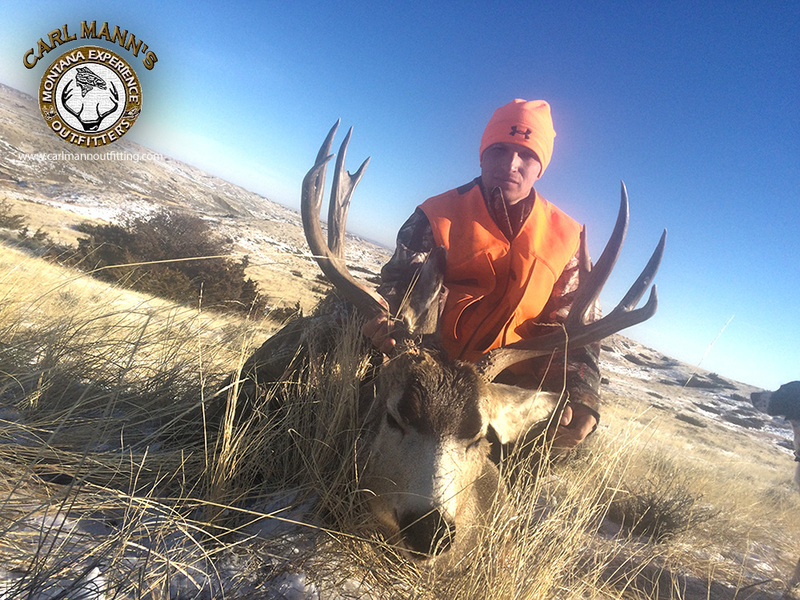 With our 1st hunt, you will be able to apply for the Antelope tag. If drawn, you should be able to harvest a very fine Buck, around 131/2 to 151/2 is typical. They will score 160 - 182 Boone and Crocket points. Also, on the 1st hunt, upland game birds, coyote calling, jumping ponds for ducks and geese, and fishing are all available. 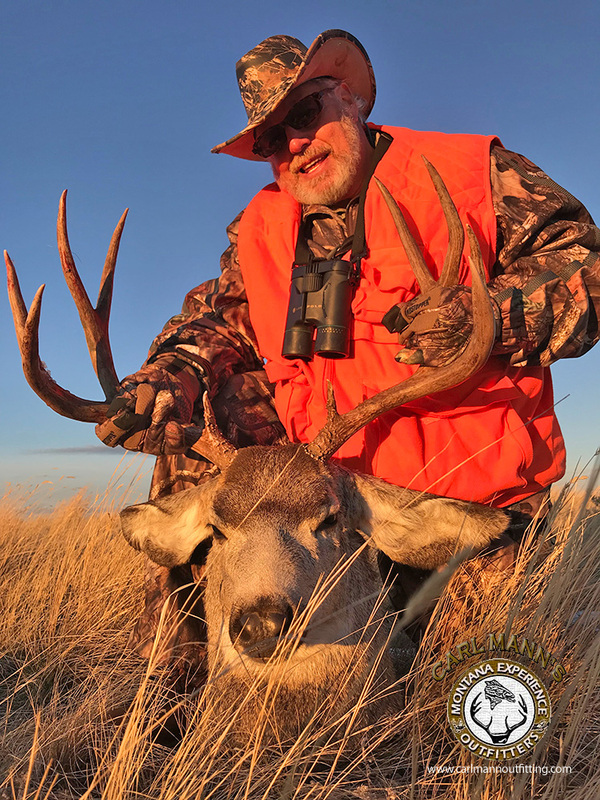 We get everybody out after one of these extra activities after you have harvested your mule deer buck and maybe an antelope too. The weather is usually nice. 65 degrees in the day and 30 degrees at night; however, it can get cold. 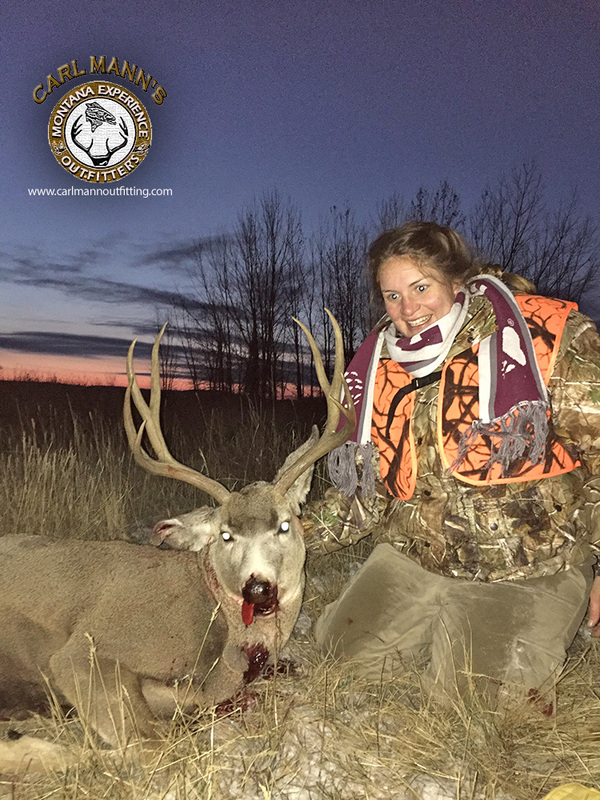 Most bucks at this time are running in bachelor groups which make it nice to be able to choose the best one. Generally, they are running in groups of 3 to 6 bucks with 1 or 2 really big bucks mixed in. No one has shot any bucks at this point so all the bucks that are going to be there, are there, and the big bucks haven't gone in to nocturnal mode yet. This time of year is an excellent choice. Our 2nd hunt is the same as our first hunt except it is a 4 day hunt. you still may pu in for the antelope draw and I do believe we can get both a mule deer and antelope buck in that hunt. The weather may start to cool down. The guides have been out hunting in the 1st week of the season and have a really good idea where to take you to harvest your buck. Our 3rd hunt is what we call the "pre-rut hunt". A lot of bucks are starting to come out of hiding and are sniffing around. Bachelor groups have broken up and a lot of the bucks have come from their hiding place and moved into the "doe areas". By now, most of the guides have hunted all their favorite spots and know where most of the good bucks are. The weather is still fairly mild and we have a mixture of different things to do after you have harvested your buck. Fishing is still possible, some northern flights of waterfowl have now moved in, and pheasants and grouse are still open. Calling coyotes is always an option and a great way to spend a day, and they do make a beautiful rug. Our 4th hunt is the beginning of the rut. Big bucks seem to be coming out of the "wood work". We now see bucks we haven't seen all season. The weather has turned to winter and deer need to feed most of the day. This change in weather also brings in large flights of ducks and geese. Coyote calling can be very good at this time; the furs are prime and make a beautiful rug for your wall. You will no appreciate staying at "The Historic Fort Peck Hotel and Lodge" with a warm hunting atmosphere and a well stocked bar. Sitting around the fireplace telling war stories of the day is a large part of the hunts. We also may float the Missouri River. Fishing is still good and the open water provides good duck and goose hunting. Our 5th hunt is much like the 4th hunt except the bucks are in the peak of the rut. It is what I call "stupid rut". This is when a guest will shoot at a buck and miss, and miss and miss and the buck still pays no attention to you. He is only focused on the doe. There are very few people left out in the field hunting. The waterfowl is probably at its best by now and there are still plenty of pheasants around.